There has been a movement underway to return to buy-fresh-buy-local. 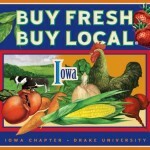 Whether initiated as a corporate gesture with Des Moines’ campaign for “Buy into the circle” or through the various farmers markets, it urges us (consumers) to connect with the product we buy. When we buy a corporate product (i.e. mass-produced product), we lose our connection to the soul of the product – regardless of what the product may be. I once argued strongly on this position with the then CEO and Chairman of a large insurer in Des Moines who was initiating a offshoring undertaking. My position was that the company’s bread and butter business came from small businesses – a fact the company touted in its marketing. Yet, through the very act of offshoring, it was going to disconnect from the small businesses – the consulting and IT shops in Des Moines, and lose not only their insurance business as their profits dropped, but potentially because the firms themselves would be out of businesses in short order. It went against Thomas Friedman’s “The World is Flat” journal, and it went against bottom lines of the insurance company, but I argued, that it would be better for the community if the company were to continue nurturing its local economy to the fullest. The landscape is markedly different today, with the mid-sized firms mostly non-existent from the software and services marketplace, replaced instead by the mega-outsourcers or those with tiny groups of developers with rare exceptions buying the company’s products (from my informal email surveys…). Though I am not as well traveled as many, I do see the spirit of supporting your community alive in UK, Italy, and now Germany. Pick up a tiny plastic watering can and turn it over – Made in Germany. See the cars on the road – German, bread and rolls sold in a gas station – being baked by the cashier behind the counter (Casey’s style! ), hotel checkout receipts with the name of the proprietor who owns it – in today’s case “The Armatowski Family”. It was alive in London and Cornwall, Rome and Florence, and just as I remember from the city of New Delhi. You can’t help but have a different connection with the product you’re using or buying when a human being is attached to it. I think it will take a lot more than us buying some fresh produce from the seasonal farmers markets – if we want a true buy-fresh-buy-local, we will need to seek out the people who sell us everything from food and lodging to our goods and services, software, insurance, lawn care, pest control, car repair, office supplies, and much more. If we don’t know who we are buying from, do we really connect with them enough to care?